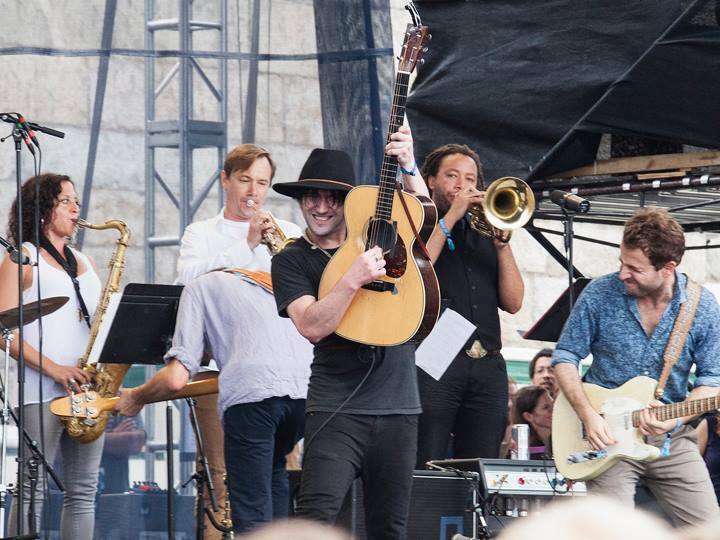 The Newport Folk Festival may not be a monster fest on the order of a Bonnaroo or a Coachella, but it has rejuvenated itself over the last half dozen years into a premier summer stop for a broad range of alternative, indie, country-rock and folk acts. Much of the rejuvenation has been the result of a conscious decision by festival organizers to loosen the definition of “folk” to include a much wider swath of bands – really anybody who could plausibly include an acoustic guitar at least somewhere in their set list. And Newport’s relatively small size – on the order of 10,000 or so fans a day – is a virtue, making the festival more intimate and accessible than some of its larger brethren. 1) Jenny Lewis – Jenny Lewis has hit the road this summer in support of her first new album in six years, The Voyager, which came out last Tuesday. I saw her several months ago, during which she played a couple of tracks from the forthcoming (at that time) disc, but at Newport it was clear that she’s grown into the new songs live, and she devoted a good half of her set list to The Voyager, including opening with “Just One of the Guys,” an ode to tomboys that is the album’s first single, and closing with “She’s Not Me,” one of those songs about a man in her past that populate Lewis’ songbook. I’ve been listening to advance streams of The Voyager for several weeks and it seems even stronger than her previous release, 2008’s Acid Tongue. 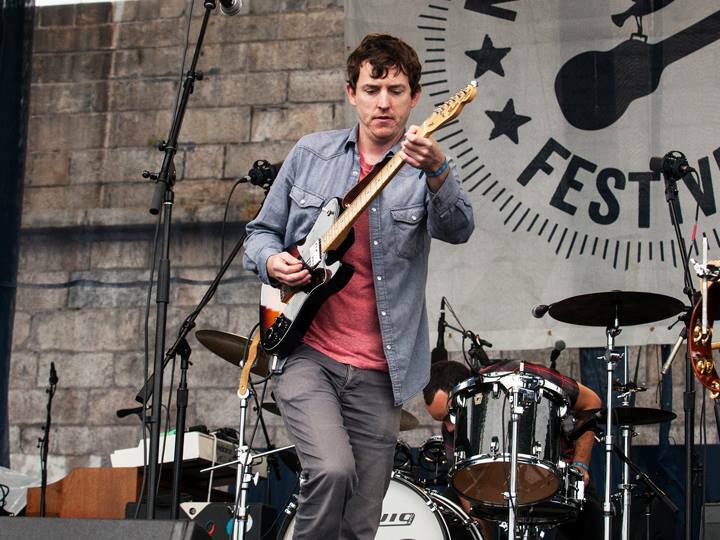 The new songs, mixed with hits from Lewis’ Rilo Kiley days like “Silver Lining” and “A Man/Me/Then Jim,” about the “slow fade of love,” made for an early highlight on the festival’s first afternoon. 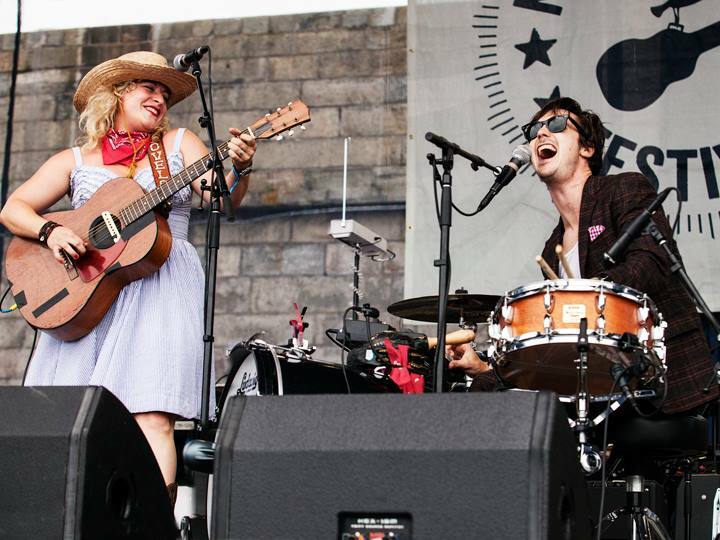 3) Shovels & Rope – This wasn’t Shovels & Rope’s first time playing Newport – they were in the lineup last year – but it was their first on the festival’s hallowed main stage, and they deserved to be there. The husband-and-wife team out of Charleston, South Carolina – Cary Ann Hearst and Michael Trent – look like Dust Bowl outlaws from the 1930s, but outlaws who happen to be able to play guitar, harmonica, drums and anything else you can hit with a stick. What they produce is a fusion of country, folk and rock that is almost impossible not to get up and dance to. 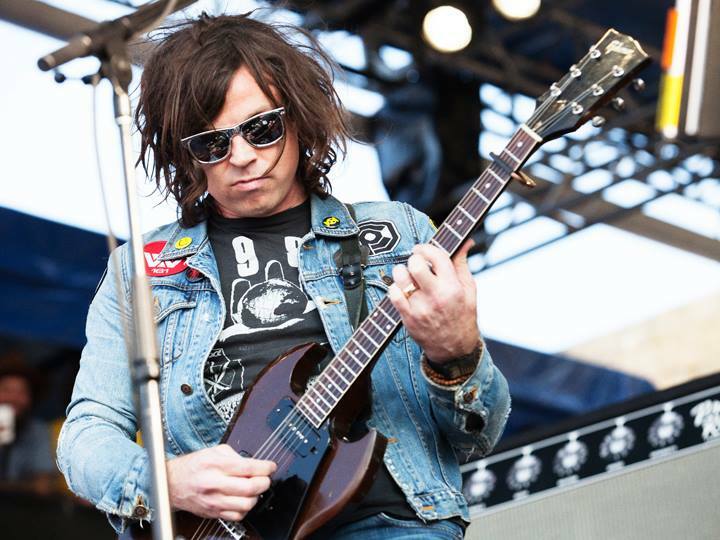 They too have a new album on the way, titled Swimmin’ Time, due for release this month, and they included five new songs in their 12-song set list. Particularly good were “Devil Is All Around” and “Coping Mechanism,” the latter a piano soul number they were playing in public for the first time. Other highlights included the semi-autobiographical “Birmingham” – Hearst introduced the song by saying, “Let me take you on a tour of our life” – and a foot-stomping “Hail Hail” to close the set. 4) Houndmouth – Newport – or any festival, really – is great for putting young acts in front of a wider audience. 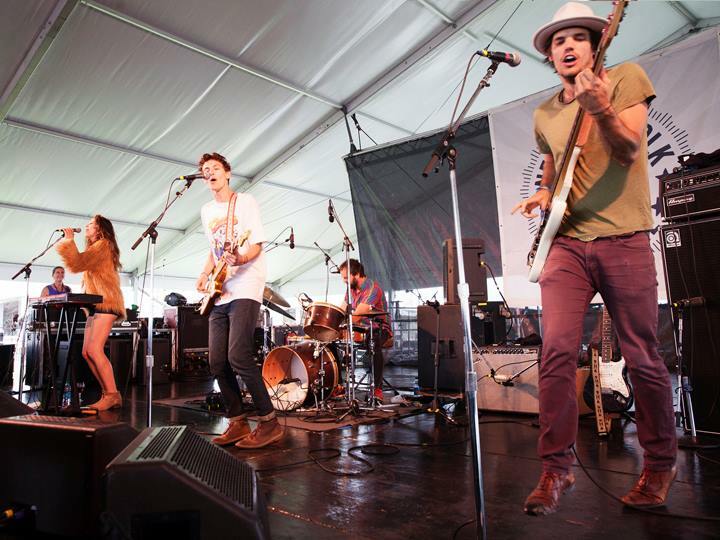 One such band at this year’s Fest was Houndmouth, a young quartet out of Indiana. 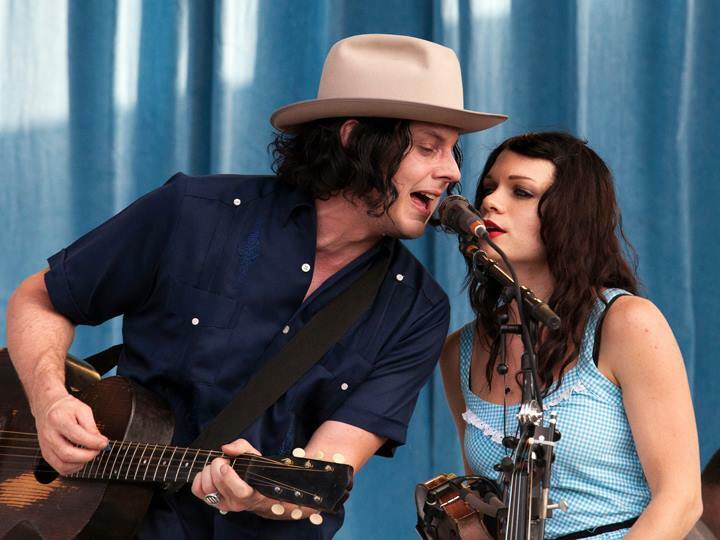 They have a single album under their belt, 2013’s From the Hills Below the City, and mine a similar vein as Shovels & Rope: Americana and alt-country-rock and folk. A lot of smokin’ and drinkin’ and cussin’ and cheatin’ goes on in their songs, just like in real life. The tracks from their one album filled most of their 15-song set, sandwiched between a Funkadelic cover (“Can You Get to That”) to open and a Stones cover (“Loving Cup”) to close. If you’re into Exile-era Stones, you just might want to check out Houndmouth. 5) Lucius – Jess Wolfe, Holly Laessig and the three boys who make up Lucius may seem the oddest fit for a festival like Newport, but they’re really not. The premium this band places on style – Wolfe and Laessig always sport matching, haute couture outfits – should not mask their real musical talent. Wolfe and Laessig met at Boston’s Berklee School of Music, and hooked up with their three bandmates after moving to Brooklyn. Underneath their pop exterior lies a band more infused with Americana than many casual listeners may realize. They were everywhere during the festival weekend, singing with acts as varied as Jeff Tweedy, Mavis Staples, Shovels & Rope and Tall Tall Trees. They brought a banjo player with them, in a nod to Newport’s folky roots, but largely stuck to their percussive, high-energy indie pop/rock on standouts like “Tempest,” “Nothing Ordinary,” “How Loud Your Heart Gets” and “Turn It Around.” There’s a reason this “pop band” keeps showing up at places like Mountain Jam and Newport Folk; if you’ve been inclined to write them off without ever giving a listen, you may want to reconsider. 6) Jack White Goes Acoustic (Sort Of) – This much I know: Jack White is simply tuned to a different frequency than the rest of us. White was the festival’s biggest act, given the headlining slot on Saturday night. When he strode on stage a little after 6 pm, with the sun starting to set across Narragansett Bay, he was crackling with a sort of manic energy, all wired up with no outlet save the music. Clad in blue shirt, shades and tan hat, White picked up the electric guitar he intended to use for his opening song only to find that it was not tuned properly, leading him to furiously shunt it aside in favor of an acoustic. There’s always a sense that Jack White can blow if something isn’t quite right, but he seemed to recover from this opening miscue without too much emotional trauma, launching into an opening suite that sampled The White Stripes’ “Dead Leaves and the Dirty Ground,” Son House’s “Death Letter” and his own solo tune “High Ball Stepper.” White left “Seven Nation Army” off the set list, but did play “Icky Thump,” which may be about as far from Pete Seeger’s Newport as one can go and still be on the bill. More than most guitarists, White plays to his drummer, the incomparable Daru Jones. Whenever the energy level amped up, White could be found in front of Jones’ drumkit trading licks with his percussionist. The real highlights of his set, though, were when he moved into more Newport-friendly territory, on countrified numbers like The White Stripes’ “Hotel Yorba” and “We’re Going to Be Friends,” or “Entitlement,” a song off White’s new album, Lazaretto, released in late June, which featured a long coda by fiddler Lillie Mae Rische. The famously private White tipped his hat to Newport near the end of his set, saying, “For the first time I walked around a festival and watched bands out in the open and everyone left me alone.” He closed the day out with a nod to the late Pete Seeger, covering the folk standard “Goodnight Irene,” joined on stage by many other of the day’s acts. 7) Ages and Ages – Ages and Ages have been around for five years, and some of their members are closer to their 30s than their 20s, but they still feel like a “young” band. Their second album, Divisionary, was released earlier this year, and they played a confident and compelling set on the festival’s main stage early in the day on Sunday. They opened with three songs off the sophomore disc: “Light Goes Out,” “No Pressure” and “I See More.” The six members Ages and Ages can overlap their harmonies akin to the way The Band did back in the day, and really shone on the spiritual “Our Demons” and “Over It” midway through their set. 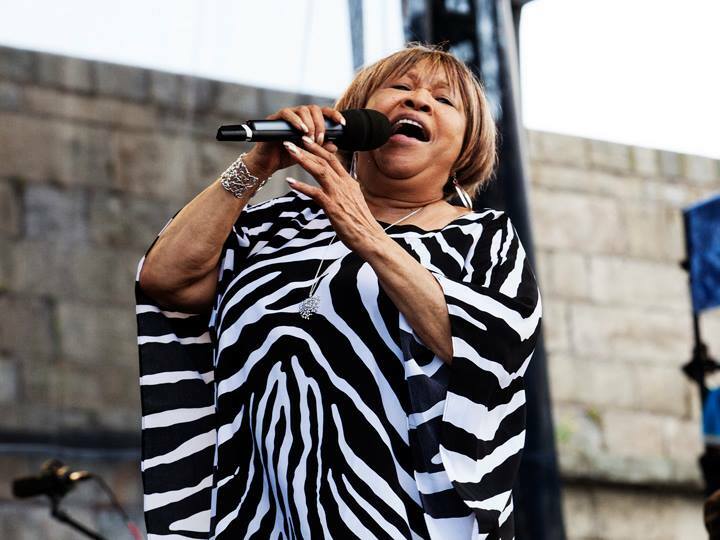 They closed out their too-short set with an uplifting version the title track from their new album, joined by members of the Berklee Gospel Choir. 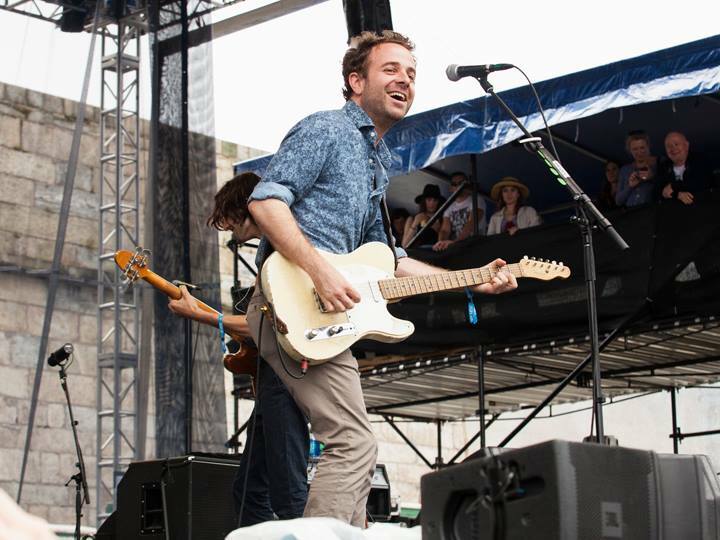 8) Dawes – Dawes is another of those bands that has made multiple Newport appearances, but for the first time was playing the main stage. I’ve seen Dawes twice in the past, and they improve each time. When they hit the stage on Sunday afternoon, it was as grizzled old veterans of the road, whose live performances have been sharpened to a keen edge. The Newport crowd clearly has a place is its heart for Dawes, giving the band a hero’s welcome at the start of their set. They opened with a trio of strong songs, one from each of their three albums: “That Western Skyline,” “Most People,” and “Time Spent in Los Angeles.” Taylor Goldsmith is a literary songwriter along the lines of a Jackson Browne (with whom Dawes has played in the past), but it is still in live performance where this band truly shines, propelled along by Griffin Goldsmith on drums , Wylie Gelber on bass and Tay Strathairn on keys. The high point of their excellent set was a majestic version of “When My Time Comes,” although closing tracks “A Little Bit of Everything” and “From The Right Angle” were pretty damn good too. 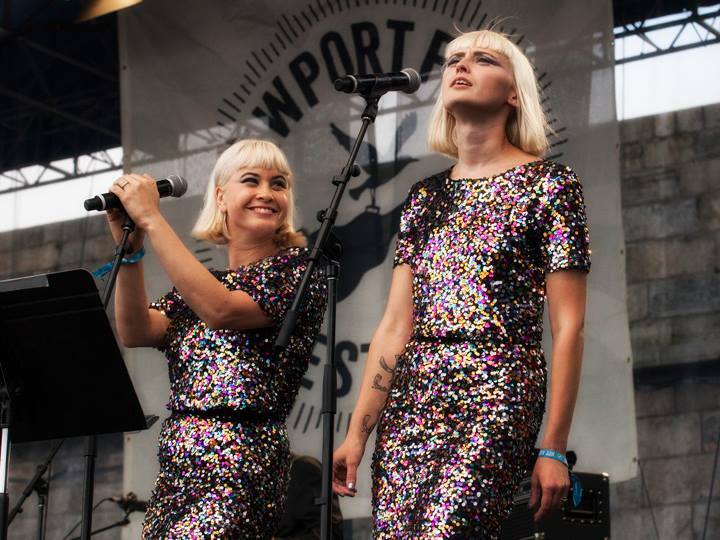 Check out more photos from the 2014 Newport Folk Festival.